Jim Gerrish, author and owner of GrazingLands Services, spoke to nearly 350 attendees at the Western Pennsylvania Grazing Conference March 16. CLARION, Pa. — Grazing enthusiasts packed into the Northwest Pennsylvania Grazing Conference March 16 as it celebrated 20 years. 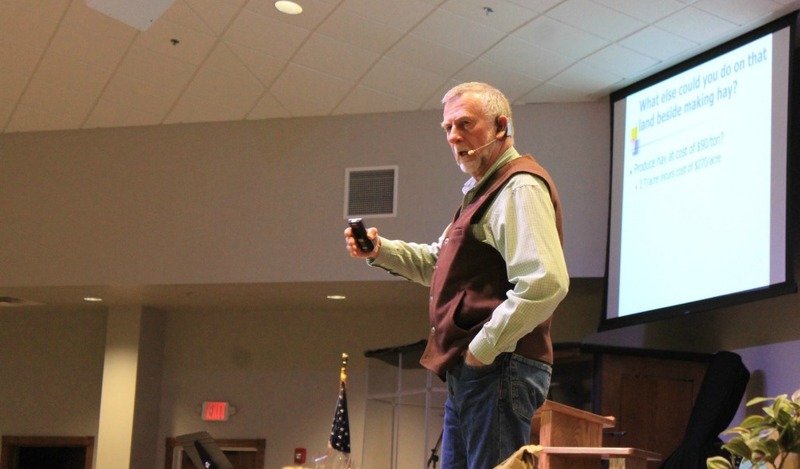 This year’s agenda brought in experts from Idaho, North Dakota and Ohio, and nearly 350 participants attended to hear keynote speaker Jim Gerrish, author and owner of American GrazingLands Services in May, Idaho. Gerrish discussed the myth that intensive grazing is about cows grazing more vigorously. Gerrish, author of Kick the Hay Habit; A Practical Guide to Year-Around Grazing and Management-intensive Grazing: The Grassroots of Grass Farming, discussed optimizing solar energy. “It is about managing the resources of space and time, getting the most out of your pastures. Sunlight hitting bare dirt is a missed opportunity,” he said. Overgrazing is caused by failure to mange time, Gerrish said. He shared the three cardinal sins of grazing; starting too early, grazing too short and coming back too soon. In most grazing operations, decreasing inputs is hard to do, said Gerrish. “The goal should be to is increase efficiency — like going to a daily rotation and managing pastures to get optimal nutrition and tonnage,” he said. When to move cows is a decision based on space and time. “If you have a better feed source to move to, it is time to move,” advised Gerrish. During this stage, the structural fiber or indigestible fiber in the plant allows the cows to leave more of the plant standing. Perennial pastures get more water into the soil than anything else, and healthy pastures and soils have perennial roots deep into the soil. Focus on getting more production out of every inch of water, said Gerrish. “Each season, you hone your skills and try to move toward that ideal target,” he said. Reflecting on the western Pennsylvania landscape, Gerrish believes the biggest challenge to grazing is mud, the downside of water. The Millers have finished medium-framed cattle such as Angus, Shorthorn and Herefords, among other grassfed livestock, since 1999. They talked to the crowd about the three ways they sell beef: custom cut, direct to consumer and wholesale. “Direct to consumer is where we see our highest return, but it also has the most inspection needs and takes the most marketing effort and time,” Melissa said. One tip they emphasized is selling the whole animal, and finding ways to make money on each part, even the bones. The Millers process 60-70 cows per year, buying them between 400-600 pounds and feeding them out on grass and hay. When asked about finishing weight, Aaron shared that it doesn’t matter. They don’t finish the cattle to certain weight, but rather on fat content. They butcher when the cattle are finished the right degree for the animal’s frame. 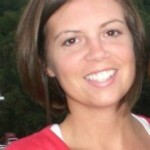 “The growth potential for grassfed beef and other livestock is huge,” said Melissa. The Millers feed hay for much of the winter, but Gerrish told the audience to kick the hay habit if you are really in the livestock business. Technology has made making hay too easy, said Gerrish, but don’t get sucked in. A half-ton bale of hay has $30 of nitrogen, potassium and phosphorus in it, 80 percent of the soil’s nutrients are harvested and moved off the land in the hay. Once you add repair and maintenance, fuel, labor, and equipment depreciation, you have a lot of money in a bale of hay. He says it takes 600 cows to justify owning any modern hay equipment. The Headwaters Resources and Development Council will be post additional resources from the conference at www.headwaterspa.org.